A London-based illustrator, Taylor, 23, got involved through an ad. 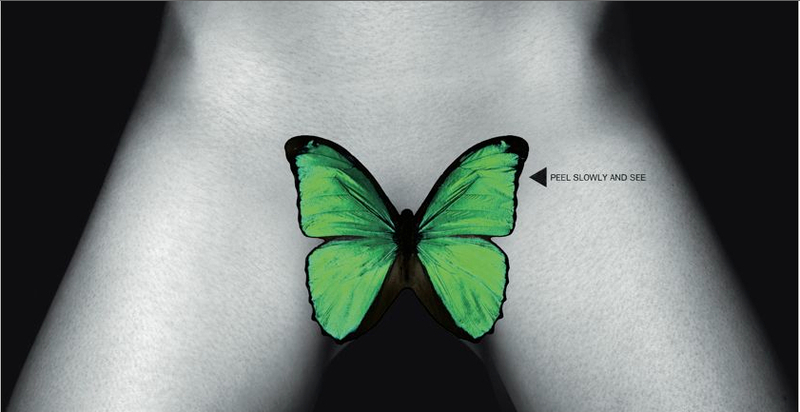 Tattoo artist Mo Coppoletta was handpicked by Hirst to ink the green-and-black tat. “It’s a part of the body you can’t reach well,” he said, and it took two sessions to complete from Hirst’s design. Did it hurt? Says Taylor, “I was hoping it might feel kind of nice, but it was probably the worst pain I have felt. I thought I was going to pass out.” Taylor met with Hirst -- who didn’t sign the piece -- to show him, and also threw a garden party with friends to celebrate. The finished “product” was then photographed for the cover of the debut issue of art philanthopist and socialite Dasha Zhukova’s provocative new art magazine Garage, which has already drawn bans from WHSmith even though to see the offending region in question, you have to peel off a sticker affixed to the cover. From the NY Post and Arrested Motion.